Android system uses SQLite database to persist information. 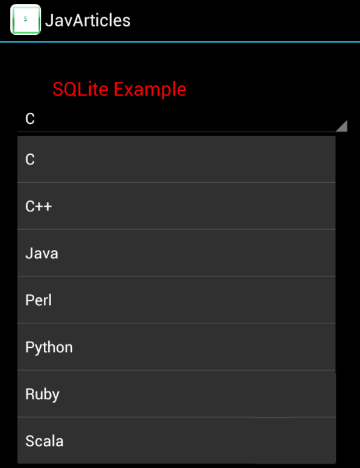 This example introduces you to Android provide SQLite Helper classes like SQLiteOpenHelper and SQLiteDatabase. SQLiteOpenHelper is the helper class that provides a connection to the database. In this example, we will create a spinner widget and then set its adapter based on the values from a database table. We will build our example on our previous spinner article. Our main screen contains just the spinner widget. It contains a list of languages. We will insert the below languages into a database table as we create the database first time. Our SQLIte helper class extends android provided SQLiteOpenHelper. To access a database using the SQLiteOpenHelper, call getWritableDatabase() or getReadableDatabase() to open and obtain a writable or read-only instance of the underlying database, respectively. We create the schema when our application starts in the onCreate() method. We also read the languages array and insert rows. a later version of our application, in which case we will increment the schema change and alter schema in onUpgrade(). Method getLanguagesFromDb() retrieves the languages and returns as a list. + " FROM " + TABLE_LANG + " ORDER BY "
In our main activity, we create SQLite helper object and retrieve the languages from the database. Next we create ArrayAdapter based on the retrieved languages list and set the adapter to the spinner widget. We know now that the data was created but in case you want to verify your database, table structure, or new few queries. You can do it using sqlite3. Cd to android SDK home and then \platform-tools. Mine is at C:\android\sdk\platform-tools.